Glide just metres above the rainforest canopy on this amazing 7.5km journey. 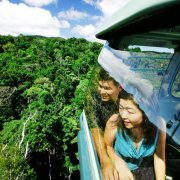 Enjoy stunning, panoramic views, rich wildlife and tropical rainforest. 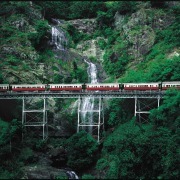 Skyrail is situated in World Heritage listed Barron Gorge National Park, a convenient 15 minute drive from Cairns city and 50 minutes south of Port Douglas. Operating in all weather, rain or shine, the experience takes 1.5hrs to complete one way, this includes spending 20 minutes at each of the two mid-stations. For a return experience allow 2.5 hours plus time to spend in Kuranda. Gondolas leave the station continously. Each standard gondola seats up to 6 people. Diamond View gondolas depart every 7 minutes - bookings are essential, particularly during busy times. The Diamond View gondola upgrade seats a maximum of 5 people, and offers a unique perspective of looking straight down from the treetops to the forest floor through the glass flooring for the entire Skyrail experience. 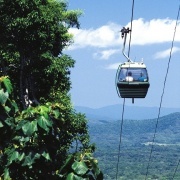 Skyrail's Smithfield Terminal is located 15 minutes north of Cairns City and 50 minutes south of Port Douglas. The terminal features a retail store, the Canopy Cafe and entry/exit to the rainforest cableway. Lush rainforest surroundings at Red Peak Station invite you to take a closer look at the diverse array of plant species, including the towering 400 year-old Kauri Pine. Explore the forest floor on Skyrail's 175 metre rainforest boardwalk, which meanders through the tropical undergrowth taking you past majestic buttress roots, beautiful tree ferns and climbing wait-a-while palms. Guided tours are held regularly throughout the day, where Skyrail's Rangers share their environmental and cultural knowledge of the area. Rainforest displays, touch tables and interpretive signage complete your visit to Red Peak Station. The majestic Barron Falls can be enjoyed from three lookouts along easy access rainforest walks. Standing at a mighty 260 metres (853 feet) tall, Barron Falls is the most visited place in the Wet Tropics World Heritage Area. At Barron Falls Station you can discover the fascinating history and evolution of the Wet Tropics World Heritage area with a fun learning experience at the interactive Rainforest Interpretation Centre. Touch-screen computers, a microscope, videos, and pictorials will help you unravel some of the mysteries of this complex ecosystem, while enhancing your enjoyment of the rainforest. The Kuranda Terminal is just a short walk from the village of Kuranda, and adjacent to the Kuranda Railway Station. Rainforest walking tracks can take you from Coondoo Street in Kuranda, on a gentle 3km circuit through the Jumrum Creek Conservation Park, along the banks of the Barron River and back to the Kuranda Railway Station. The Djabugay Aboriginal Guided Tour at Barron Falls provides a fascinating insight into the Aboriginal history, language, culture, stories and traditions of the indigenous rainforest people through a personalised, small group [maximum 10 guests] on a 40 minute guided walking tour through the rainforest. 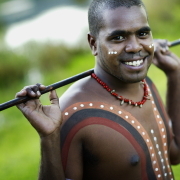 Walk in the footsteps of the Djabugay people on our natural rainforest trails. Skyrail operates a coach transfer service from most accommodation houses in Cairns, alternatively if you have a vehicle you can drive yourself to Skyrail or Freshwater Railway Station )Skyrail and Kuranda Scenic Railway package). Please note Freshwater Railway Station is approximately 7km from Skyrail's Smithfield Terminal. Coach transfers can be organised between the two locations (fee applies).